Did you know? I love to jury! It’s such a cool way for me to get to look at a huge cross-section of artists that I might not encounter any other way. 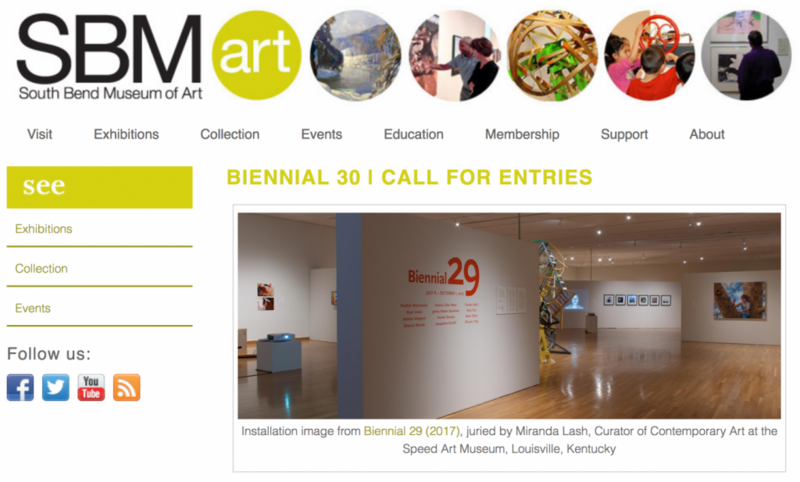 I’m excited to announce that I’ll be the guest juror for the South Bend Museum of Art’s upcoming Biennial 30 – open to all artists residing in Illinois, Indiana, Iowa, Kentucky, Michigan, Minnesota, Ohio and Wisconsin. You can get all the pertinent details at the link below, and I strongly encourage you to apply! Of course, it goes without saying that you should direct ALL inquiries to the terrific Mark Rospenda at SBMA, and definitely DO NOT send anything to me directly! I look forward to seeing your application! The South Bend Museum of Art’s all media Biennial 30 will present a diverse look into contemporary artwork in the Midwest and is open to all artists residing in Illinois, Indiana, Iowa, Kentucky, Michigan, Minnesota, Ohio and Wisconsin. The number of exhibiting artists is deliberately limited to allow for the showing of a greater body of work by each artist. $1,500 in awards will be selected by the juror and $1,500 in purchase awards will be chosen by the South Bend Museum of Art’s Collections Committee. A color brochure of exhibiting artists will also be produced. There is a $15 entry fee to apply. This year’s exhibition will be juried by Sarah Rose Sharp.